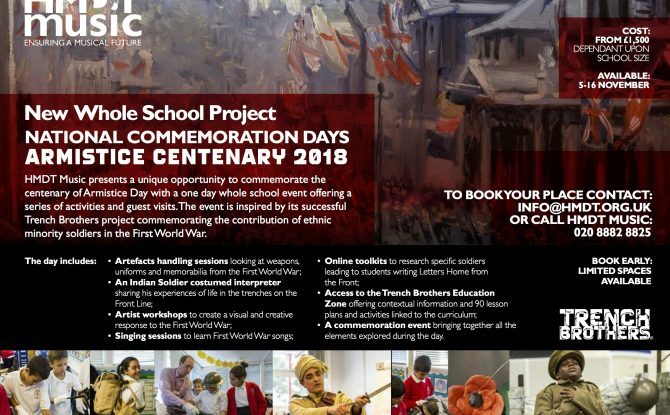 HMDT Music presents a unique opportunity to commemorate the centenary of Armistice Day with a one day whole school ever offering a series of activities and guest visits. The event is inspired by its successful Trench Brothers project commemorating the contribution of ethic minority soldiers in the First World War. A commemoration event bringing together all the elements explored during the day. Available 5 – 16 November 2018. Cost: FROM £1,500 Dependent on school size.